Experience Fishing And Beach Living On One Of The Yucatan’s Most Enchanting Islands. Anglers looking for world-class opportunities at large and baby Tarpon can combine this exciting new fishery with the charm of a small and undiscovered paradise. 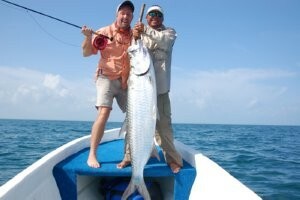 Fly fishing and spin fishing are offshore in clear salt waters and in the shallow flats and back water Mangrove lagoons. Non fishing partners can explore the island, snorkel with Whale Sharks, kayak, windsurf, swim in Sweetwater Cenotes and glass the migratory Flamingo flocks of Bird Island. And there is always the Mayan Ruins of Chichen Itza and Ek Balam for the cultural fill up. Savvy travelers will immediately recognize the “Off the Path” allure of this little island with its continental flavor. No cars, dirt roads and superb international restaurants are the first clue. 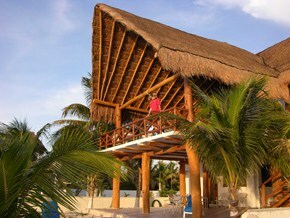 Open year-round, Holbox Fly Fishing Lodge is a “can’t-miss” warm water fishing destination. Check out the other sister lodges at www.greatalaska.com in Alaska and www.jungletarpon.com in Costa Rica.